You are here: Home / Recipes / Snacks / Delicious Cherry and Grape Tomato Recipes? APPSolutely! The cool air comes in and the harvest begins. I LOVE the fall so, personally, I couldn’t be happier about this crisp, autumn air, especially since it’s been such a hot and humid summer and I haven’t a simgle palm tree in sight. It’s just unfair. 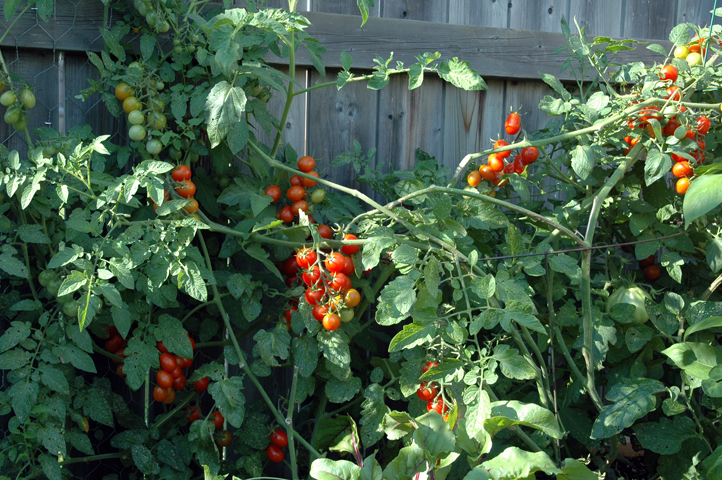 This summer’s weather has been ideal, however, for our garden of tomatoes; we have an abundance of cherry and grape tomatoes framing our backyard. After months of proudly nurturing and growing these garden sweets, what to do with them all now? Well, while they’re fresh like this, no salad shall go without and all things goat cheese shall be paired. A fresh cherry tomato is like garden candy and must be celebrated. Once the household is tomatoed-out, I’ll start the sauce process. Here are a few of my favourite grape/cherry tomato appetizers. Each begging you to invite the neighbours over and celebrate the flavours of summer, while embracing the awesomeness of autumn. Note: I’ve said it before and I’ll write it again, always have your freezer stocked with puff pastry ready to create with. It’s such a simply delicious and versatile ingredient. A perfect start to any harvest supper. I like to garnish anything with tomatoes with basil but I'm a sucker for that fresh basil flavour. Am I alone in hearing “fancy pants” anytime someone starts talking “reductions”. There’s really no need to make it more pretentious than it is. A reduction simply implies a liquid has been heated to remove excess moisture and water, causing it to become a thicker consistency and concentrated flavour. 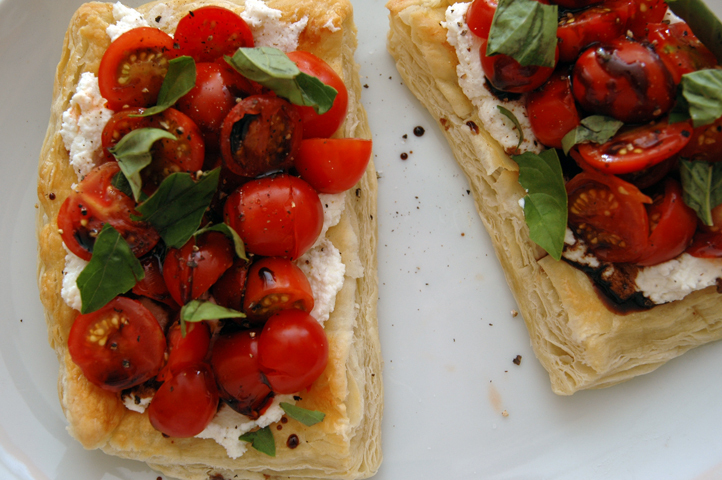 This balsamic reduction adds a sour to the sweet of the tomatoes and the salty of the cheeses. An excellent combo. Heat the oven to 400°F and arrange a rack in the middle. Cut a sheet of puff pastry into 6 (4-inch) squares and place the squares on a parchment-lined baking sheet. Brush with egg wash and bake until golden and puffed, about 20 minutes. Meanwhile, bring balsamic vinegar and honey to a simmer over medium heat and cook until reduced and syrupy, about 3 to 5 minutes. Place 1/4 cup ricotta and 3 tablespoons goat cheese in a medium bowl, season with salt and freshly ground black pepper, and mix until evenly combined. Perfect little snacks for family movies, euchre tournaments and lake-watching at the cottage. 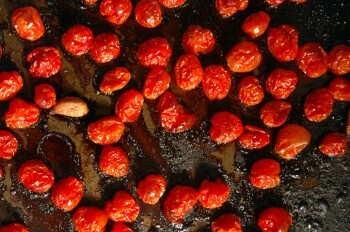 Cut the tops of your cherry tomatoes and gently scoop the inside flesh and seeds with a small metal spoon. Using a spoon or piping bag, replace the flesh with any combination of ricotta, goat cheese, cream cheese and seasoning. Here I added minced garlic and ev olive oil to the cheese blend and topped with a little parsley. A little messy but they were the perfect little bite-sized fresh tomato poppers while we enjoyed some family time at the cottage. Lesson learned, don't forget the parchement paper. Still, totally worth the 6 hour soaking and scrubbing period. STILL looking for ways to effectively use all of those tasty little red bulbs? Roast them. Preheat oven to 300°F. Line a baking pan with parchement paper and spread your tomatoes in a single layer. Sprinkle with sugar and salt, then coat with olive oil. Sprinkle with herbs and roast for about 30 minutes, so that tomato skins are crinkling and splitting, but not fallen apart. Cool and serve on garlicky toast as bruschetta, as sandwich spread or mixed into hot pasta. Yum – they all look great! 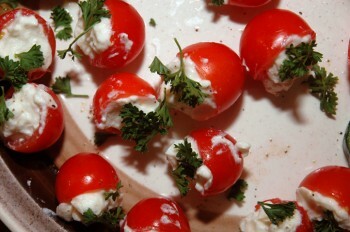 I stuffed some with spinach dip for a 45th Anniversary party and could have made a triple batch – stuffed cherry tomatoes always look fancy and are a winner – looks like you’ve come up with some great combo’s too!